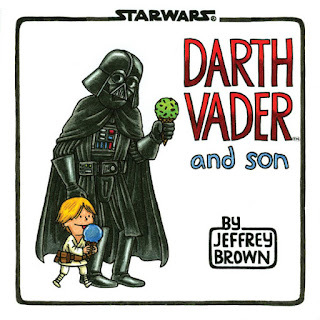 My friend and blogger Katherine from Grass Stains sent me a link to excerpts from the new book Darth Vader and Son by Jeffrey Brown. 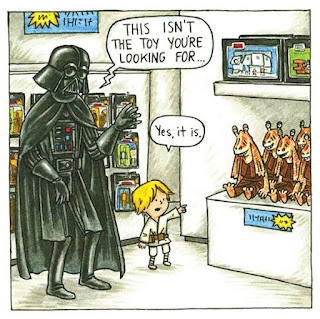 The book imagines what may have happened if Vader had played an active role in Luke's life. The samples slayed me, so I bought it. No regrets for a geek like me. Here's one of my favorites. You can see more excerpts and check out the book trailer and buy it for yourself. Lemon: I’m going to stop you at Kevin. Has anyone ever known a good person named Kevin? Jack: Kevin Garnett helped me move once. Kevin Costner cooked me dinner after a bad breakup. Kevin Sorbo introduced me to his podiatrist. I fell for Eric Hutchinson when Entertainment Weekly told me I would if I listened to his live album Sounds Like This. I left that on repeat and attempted to clean my house in-between the soul breaks. His new album, Moving Up Living Down was just released and he does not disappoint. He's a nice mix of folk and pop and sounds like Jason Mraz and Gavin Degraw which I don't hate. But you might. But we can still be friends. I've included his single, The Basement above. You can download his first single Watching You Watch Him free from iTunes this week. Recommending Disclaimer: I don't suggest anything because I get it free or because I have some sort of illicit relationship with Darth Vader or Tina Fey. I save all of those questionable dealings for UPS drivers.